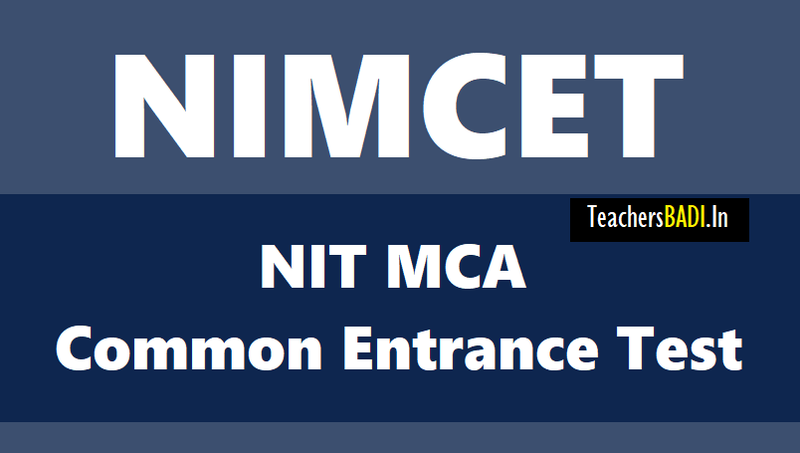 NIMCET 2019 : The NIMCET is NIT MCA Common Entrance Test, a National Level Test conducted by NITs for admission in to their MCA programme. The admission to the MCA programme in to NITs at Agartala, Allahabad, Bhopal, Calicut, Durgapur, Jamshedpur, Kurukshetra, Raipur, Surathkal, Tiruchirappalli and Warangal for the year 201-19 is based on the Rank obtained in NIMCET-2019 only. National Institutes of Technology (NITs) are Institutes of National Importance and are Centrally Funded Technical Institutes. The Curriculum and Syllabi of Master of Computer Applications (MCA) programme offered by NITs are designed considering the needs of different Information Technology firms in India and abroad. MCA graduates have high potential for jobs in IT Sector. (ii) B.E./ B.Tech. from a recognized University are eligible to appear for NIMCET-2019. Admissions to Master of Computer Application (MCA) Programme at NITs are open to those who qualify in NIMCET-2019 only. Application fee: Rs.1100 for SC/ ST/ PwD candidates and Rs. 2200 for Open/ OBC candidates. Online application: 01.03.2019 to 31.03.2019. Admission to the M.C.A. programme of the eleven NITs is done through a common entrance test NIMCET. Candidates must apply for NIMCET-2019 through ‘Online’ only and they must follow the instructions strictly as given in the website https://www.nimcet.in. NIMCET 2019: National Institutes of Technology (NITs) are Institutions of National Importance Under MHRD, Govt. of India. The NIMCET is a Common Entrance National Level Test, conducted by any of the NITs ,for admission in to their MCA programme. The MCA programme is offered by NITs at Agartala, Allahabad, Bhopal, Calicut, Durgapur, Jamshedpur, Kurukshetra, Raipur, Surathkal, Tiruchirappalli and Warangal .The admission into the MCA programme for the year 2019-19 in above 11 NITs is based on the Rank obtained in NIMCET-2019 only.